Let me explain this concept in the simplest way so that even a naive can understand. Banking and the stock market are very interesting businesses but the names given to their related terms seem to make it very difficult to understand. Repo and Reverse Repo are also one of them. The concept of both are very simple but economists have made it seem complicated. Let us understand this through a conversation between a dad and his teenage son. Son: I have heard recently RBI Governer has reduced Repo Rate by 50 basis points and everyone is saying that this is good for the market. Loan EMI may also come down. What is this rate cut means actually? I want to understand this. Dad: To understand this you first need to know, how does a bank function. Dad: Because all these are inter-related. Tell me – what does a bank do? Son: Bank takes money from depositors and gives loans to earn interest. That way they keep everyone happy and make a profit also. Dad: Correct, but there is more to it. Let me explain this in a very simplistic way. A bank needs money. Bank can get money from depositors like you and me and also from RBI. But the bank also needs to pay certain interest to us and also to RBI. Dad: Let us try to understand first – what happens when we deposit, say, Rs. 100 with a bank. Son: I know that. Bank gives that Rs. 100 to someone who needs a loan. Dad: No, it is not that simple. Remember, though the bank can earn interest by giving away loans, it is also very risky. There are many cases of loan defaults. This way banks can put all our money into high-risk areas. It has to be protected. Dad: Ok, RBI has made it mandatory that upon receiving, say, Rs. 100, banks first have to deposit Rs. 4 with RBI. RBI keeps this Rs. 4 in its current a/c and hence banks do not receive any interest on this money. This is known as Cash Reserve Ratio or CRR, which is currently at 4%. Dad: RBI has also made it mandatory that upon receiving, say, Rs. 100, banks need to compulsorily buy central and state govt securities of Rs. 21.50. Of course, banks will earn some interest income here. This is known as Statutory Liquidity Ratio (SLR), which is currently at 21.50%. Son: Ok, so you mean to say that upon receiving Rs. 100, banks can spend only Rs. 74.50 at its own will. Son: But you were saying that banks can also borrow from RBI. What interest banks pay to RBI? Dad: Before 30th September 2016, banks were paying 8.25% interest to RBI when it borrowed money from RBI. Now this rate has been reduced by 50 basis points. So banks now need to pay interest to RBI, if it borrows from RBI, at the rate of 7.75%. 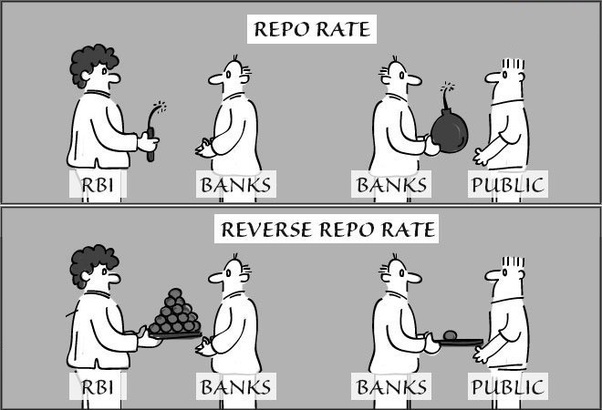 This is known as Repo Rate. Son: Can fixed deposit rate be affected by a reduction of Repo Rate? Dad: Of course. If banks get money from RBI @7.75%, why will banks pay higher interest to you and me? One year FD rate is already revised by many banks and it is equal to or very close to 7%. Son: But as now banks are getting money at a cheaper rate, then they should reduce the loan interest rate i.e. passing on the benefits it receives. Dad: Correct. They should. And on that hope market is cheering. If companies get a loan at a cheaper rate, they will likely to expand their businesses. That will create more jobs, more income and boost the economy. Son: How is inflation linked to this? Dad: See, when interest on a loan becomes less, people tend to borrow more. That means people will have more money to spend. This will increase the demand for goods, and if the supply does not increase to match this demand, then prices will increase. Son: So there is a chance, that inflation may rise also? Dad: Well, yes. But inflation depends on many other factors as well, like production (industrial and agricultural), manufacturing, export-import, foreign currency movement etc. So inflation may increase or may not. Son: One last question. Like we deposit our money with banks, can banks also deposit their money with someone? Dad: Yes, they can deposit with RBI and earn interest too. This interest is typically 1% less than the repo rate. This rate is known as the Reverse Repo Rate. Son: Great! So now I understand CRR, SLR, Repo Rate, Reverse Repo Rate and their impact on deposit rate, loan interest rate and on inflation. I hope that I made these basic concepts clear. Happy learning. Edit: @Vishwas Londhe sir asked a question that when banks can get our money at 7% (as stated above), why would they go to RBI and pay 7.7%? Well, big banks like HDFC and SBI do not have problems raising capital from retail market but smaller banks have to grow their loan book at a rate much higher than these biggies. So when the deposits from retail segment is not enough, they raise capital from rbi so as to use it to grow their loan book.